Asphalt has many well-known uses. It paves the world’s highways, seals in its roofs and keeps its driveways solid and weatherproof. But there is a whole range of lesser-known applications where asphalt provides durable protection against all kinds of harsh conditions, year after year. Here are seven such lesser-known uses for asphalt. Henry Ford is legendary for his Model T, the mass-produced ‘Tin Lizzie’ that made car driving affordable to the general public. 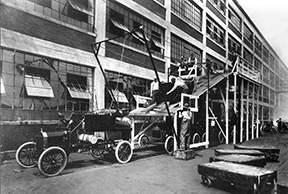 Over 15 million Model Ts were produced between 1908 and 1927. “Any customer can have a car painted any color that he wants so long as it is black,” Ford is famously quoted as saying. Offering just one color simplified the mass production process, which was central to keeping the Model T’s price low for the masses. Add the fact that Japan Black was fast drying, and one can understand why Henry Ford adopted this finish in his effort to constantly drop the Model T’s price, and, by extension, boost its sales by putting this car within the budgets of more consumers. In 1908, the first Model Ts sold for $950. By 1912, the price was down to $575; it would eventually get as low as $280 per Model T, thanks to Ford’s cost-cutting, mass production techniques – including Japan Black paint. Wooden farm fences are not the first things that come to mind when one thinks of asphalt. 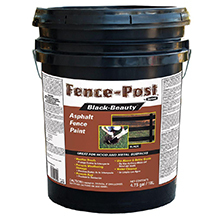 But the truth is that this substance offers tremendous advantages for farmers who want to maintain their fences, while maximizing the intervals between repainting. This is where asphalt fence paint comes in. Unlike regular paint, asphalt paint is extremely durable, waterproof and can be used both above and below ground. It also dries to the touch in just four hours. This means that a farmer has the option of painting fence posts before sinking them into the earth, thus minimizing rot and decay caused by water seepage. As well, water-based asphalt paint is UV-resistant, maintains its black color for years and protects covered nails and screws from rusting. It can also be used to paint metal pipes, storage tanks and masonry walls. One last advantage: black asphalt fence paint doesn’t show the dirt and dust the way that conventional white paint does. Cars and trucks ride on asphalt. 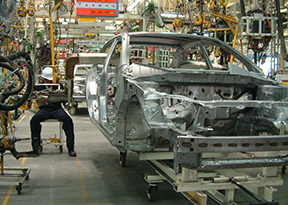 But vehicle manufacturers also use this substance to line body parts, in an effort to muffle road noise. Applying an asphalt coating reduces component vibration and absorbs sound waves caused by whatever road-induced vibration remains. At the same time, the asphalt lining helps to block outside road noise from coming into the vehicle. Such asphalt dampeners are applied during manufacturing to locations such as floor pans, trunk exteriors and other areas where noise generation or penetration can be an issue. Application techniques include asphalt pads that are applied to the vehicle and fused into place using baking, and sprayed-on liquid asphalt coatings. Beyond combatting noise, asphalt linings help to protect body metal from rust, repel the buildup of corrosive materials such as road salt and extend the durability of cars and trucks. Canadian artist Lucas Seaward lives in Fort McMurray, Alberta, in the heart of the country’s bitumen-rich oil sands. In tribute to this fact, Lucas has taught himself how to collect and then dilute surface-level liquid bitumen to create stunning monochrome wildlife paintings. It’s not an easy process. To dilute and bind the bitumen to the canvas permanently, Seaward has to mix it with a special varnish that also protects the painting’s surface. A number of Lucas Seaward’s stunning works can be seen (and are for sale) through his web site at www.lucasseaward.com. 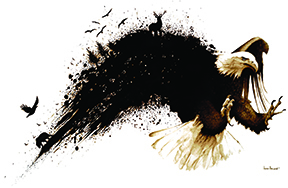 His commissions include a 13′ by 7′ bitumen canvas for Fort McMurray International Airport. On the flip side of art, graffiti is a big nuisance for urban building owners. One way to attack this problem easily is to coat a building’s external masonry/concrete walls with black asphalt paint, and then keep a few cans of spray asphalt paint at hand. When someone tags the wall, just take out the spray asphalt paint and quickly cover the offending graphic. It is fast, easy, and effective. At first glance, it may seem odd that liquid asphalt would actually provide effective first aid for trees and plant graftings. But it does, because this substance is effective in sealing wounds from invasive bugs and bacteria. In fact, few substances work as well as bitumen mixed with latex, which is why gardeners rely on both liquid and paste versions when they remove tree limbs, treat storm damage or graft new roots to plant stems. Asphalt-based products are an absolute godsend for contractors. Just ask Tim Carter. He is an experienced contractor and founder of the AskTheBuilder.com advice web site. “I use asphalt-based waterproofing compounds as either a foundation damp-proofing or waterproofing barrier on poured or block foundations to either stop water vapor or liquid water from entering below grade spaces,” Carter said.